Fried eggs and chiles desrellenos, summer squash, and yellow bell, orange juice, and water. So I was saying, welp, being a genius at using up leftovers is a dumb thing to be a genius at, but I am the Charlie Eppes of using up leftovers, and Tami said no, using up leftovers is a great thing to be a genius at, in fact, it is a lost art in our single serve society. So yay, I'm sorry I didn't post that breakast, it was baked eggs in leftover tofu, red bell, and pineapple stir fry that I stretched out with summer squash and jalapeno. 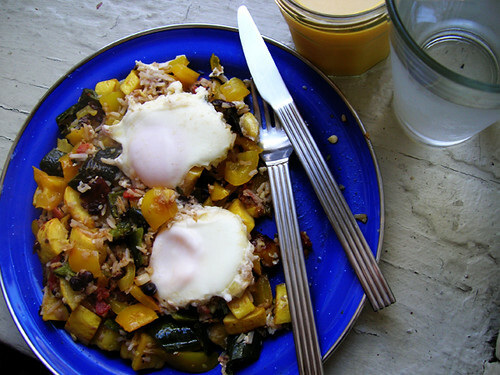 My basic formula for stretching leftovers into breakfast is to saute a zucchini or summer squash and a sweet or hot pepper in a pat of butter and a swirl of olive oil, then add in the leftovers and a couple eggs. Today's breakfast is summer squash and yellow bell with an unusually hot chile relleno, the added veg did very well to mellow out the hot. I fry-basted the eggs right in the hash. The sweetie man has been making Friday night dinners because my week is long and I am tired, and in addition to me not having to cook, it adds an lively element of randomosity to my orderliness, sort of our relationship in a nutshell.